Here’s a notion to ponder: this new novel by Kathleen Barber uses the framing device of a hit true crime podcast to examine the details of a long-gestating murder case; the notion that a man sits in jail for more than a decade, perhaps for a crime he didn’t commit, and could theoretically be set free because of the discussion as started by said podcast. This is a good start, an intriguing premise, and one seemingly inspired by the pop culture phenomenon that was the Serial podcast of 2014. That thing was a phenomenon – check it out. 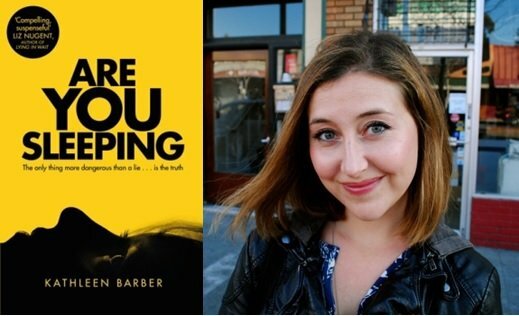 The podcast in Are You Sleeping is the springboard from which Barber’s solid narrative emerges, and it’s an interesting conceit – that after the death of a matriarch, the family is reunited for her funeral, just as the broader social media discussion surrounding the murder of the Buhrman family’s father begins to gain new traction. It kept drawing me – as a reader – to ponder how the family surrounding Serial‘s first season might have been affected by something gripping the cultural zeitgeist in parallel, and essentially oblivious to their grief. It reminded me, on a very meta-conceptual level, as being on the same page as the 1997 Frank Oz film In & Out: you have a gay high school teacher thanked from the podium at the Oscars; and a film presupposes the notion that the teacher in question isn’t (to the best of his understanding) gay. What happens next? In Are You Sleeping, the narrative ponders a similar question – what if the wiles and wild theories of a podcast producer could re-open a closed murder case, and what does this do to the surviving family members. So, that’s the premise. Intriguing as it is, and as “ripped from the pages” as it appears to be, the execution does, however, lack. We have a story revolving around one sister of twins, conflicted by dead and/or absent parents and their own very significant and palpable demons. And amid its real life, Serial influences, there still lacks a dramatic urgency: the happenings at the home of the remaining Buhrmans is sometimes underwhelming – in that the denouement is coming, you know all is not what it seems, that there is a payoff coming at least in a narrative sense, and you’re urging it to arrive lest you sit through more gussied-up whining from these deeply broken characters. Our first-person narrator, Josie, expounds her emotional problems in overly florid prose; we seldom get a sense that this character would be anything but trying to be around. The big reveal eventually arrives, and in doing so causes little ripples in your understanding of the text and its narrative. It’s not exactly an M Night Shyamalan-esque twist when it happens. As a thriller, it falls a bit short. But its unique and very of-the-zeitgeist framing make it something of a page turner, and one not without merits.